This 38,600 hectare park is located northeast of Radium Hot Springs and southwest of Banff. Mount Assiniboine stands at 3,618 metres and is noted for its spectacular hiking. Routes to enter the park include Highway 93 to Lake Magog, Spray Lake Reservoir to Lake Magog, Highway 93 to Lake Magog via the Mitchell River and Sunshine Ski Valley to Lake Magog. On the bench above the west side of Lake Magog is the main camping area. Camping is also located at the north end of Og Lake. The park is located in the Purcell Mountains, an area that has become popular with mountaineers. The firm rock, significant altitude and fierce weather conditions make for world-class challenges for experienced climbers and mountaineers. The access road begins at Brisco (27 km north of Radium Hot Springs) on Highway 95. The park entrance is 45 km west of Brisco. Although road access is reasonably easy, the few trails within the park are dangerous and demanding. Inexperienced and/or ill-equipped visitors should make arrangements to visit a more suitable area. 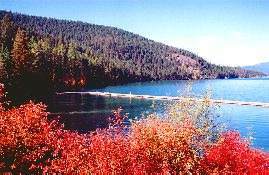 The 5625 hectare Elk Lake Provincial Park is filled with magnificent mountain peaks, glacial lakes, and forests. Follow Highway 43 from Sparwood to the community of Elkford. A gravel road from Elkford leads for about 47 km to the Kananaskis Power Line Road. From this junction it is 25 km to the park. There are four camping areas, with excellent fishing and hiking opportunities. Extensive trails lead to the parks scenic attractions. 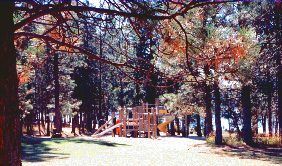 Norbury Lake Provincial Park is located just east of Fort Steele and provides the visitor with 46 lakeside campsites, good beaches and walking trails. Canoeing is a good way to explore either Norbury or Peckham's Lakes where rainbow trout are abundant. To the east of the park are the Steeples in the Hughes range of the Rocky Mountains. Located east of Skookumchuk at the northern end of Premier Ridge in the Hughes Range of the Rockies, the park provides the visitor with a campground, play area, boat launch, excellent beaches and hiking trails where the visitor may encounter Rocky Mountain big horn sheep, elk, whitetail and mule deer. The park encompasses a total of five lakes, all of which are renowned for their rainbow and eastern brook trout fishing. This 8,791 hectare Park is an alpine region of great beauty. Most of the Top of the World Plateau is at an elevation of above 2 200 metres. This Park is located in the Kootenay Range of the Rocky Mountains, 48 kilometres as the crow flies from Kimberley. There are four locations where camping is permitted in this Park and a cabin which accommodates up to 25 guests is found at Fish Lake. Because the park is trails-only access, there are many located throughout Top of the World, all varying is stages of difficulty. 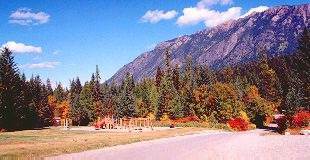 Located just off of Highway 93 north of Fort Steele, this park is one of the most popular in the east Kootenay region. A large campground, day-use/picnic area, hiking trails to wildlife viewing stations, boat launch and angling opportunities for largemouth bass in Wasa Lake are just some of the parks features. Angling in the surrounding waterways may also prove productive. The park is open year-round. 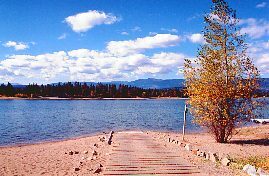 Located 21 km (13 mi) from Highway 93 east of Canal Flats via the Whiteswan Lake Road, the park provides the visitor with a wheelchair accessible campground, a day-use/picnic area, hiking trails to wildlife viewing stations, good beaches and a boat launching ramp. Whiteswan and Alces Lakes are both located within the park and are noted for the angling opportunity they provide. Both are stocked with rainbow trout annually.